So I finished the game last night. It was a pretty fast marathon in a few days. It's probably the first Zelda game where I didn't need a guide to help me with a dungeon. The only time I needed a guide was for a few specific hidden items that were optional. I really wanted to experience most of the optional gear before I finished the game. 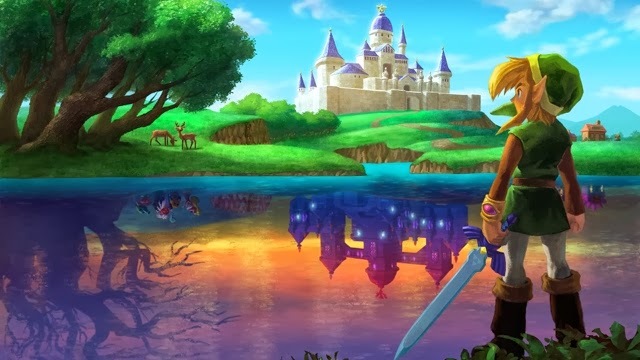 The story is good although fans of the previous Zelda games will find certain beats familiar. The game is wide open so the story pops in from time to time. I do like how they set it up and how it progressed. They added some cool stuff to the lore and I did like a few twists. The ending was super satisfying. Once again, it's a very simple story but an enjoyable story nonetheless. This is the type of game where old school fans will enjoy. The game was incredibly open and having the option to use most weapons near the beginning of the game was genius. I did find myself a bit lost at times because of how open it was. You can basically go almost anywhere. It made finding access to some of the dungeons a bit of a pain but you just need to explore a lot and you'll eventually find it. The dungeons themselves were incredible. Very well designed and super fun to explore. I didn't find any of them frustrating like with the previous full 3D games. Every dungeon forces you to use a different weapon/mechanic to get through which made them all very refreshing. I also loved how intuitive they were. I found myself figuring them out fairly quickly which also made me feel smart. I hope other devs can learn from this game's dungeon level designs. It was pretty clever in spots. Boss battles were a lot of fun and challenging. I didn't find their designs that unique or creative though. The designers seemed to have a thing for eyes or eyeballs. Most of the weapons were familiar so nothing mind blowing about them. They were all equally effective which I enjoyed and the upgrades made a few of them more fun to use. There were some features that require StreetPass to work but since I never take my 3DS outside, I didn't use any of those features. Not a big loss. Graphics were very pretty and colorful. There were really nice touches with the animations and effects. I was quite impressed with a couple of dungeons in how they presented the puzzles with visual cues only. The character designs were cute and simple. Also, I highly suggest playing in 3D. The effects were pretty well done. You don't need to max out the 3D slider. It looks great with the 3D on, period. The music...OMFG! SO GOOD! This is hands down one of my favorite game soundtracks ever. The remixed old music as well as the new tracks were all fantastic. Really great and moody and also epic at times. I played only with headphones to really enjoy it. There isn't a single bad track in the whole game. I loved every single one that played in every single area and cutscene. I can't wait to get the OST. It's that good. I'm really glad I played this. It's a fantastic game and was a lot of fun. I've been slacking and didn't play the previous major installments as well as the previous portable ones. Maybe they'll disappoint me after this one but this game was so good that I'm probably gonna check out some of the previous games in my backlog soon. You guys definitely need to check this game out if you have a 3DS. It's a must play. Agreed - an all around solid Zelda game. Much better than the DS games we got, and thankfully no more forced touch controls. Music was awesome, and the street pass feature was a nifty touch. Those 3D effects were dynamite! First 3DS game I played with the 3D slider turned on 99% of the time.